Scottish mum Rose Gentle, whose son Gordon died in Iraq in 2004, is backing the Johnston Press campaign calling on Scottish and Westminster Governments to shed light on veteran suicide figures. ''Pic: Robert Perry. Our investigation discovered that the number of UK veterans who tragically take their own lives each year is being suppressed by the Scottish and Westminster Governments. And Rose Gentle is just one of an army of voices who are now calling on the government to release the statistics. Her 19-year-old son Gordon, of the Royal Highland Fusiliers, was killed by a roadside bomb in Basra in 2004. She said: “The Government is embarrassed in case the true figures come out. It’s wrong that the information on veteran suicides is kept hidden. “In the years since Gordon’s death, the stories I’ve heard from soldiers coming out of the army are heartbreaking. “The situation for boys leaving the services now is just as bad as it ever was. “A lot of them are lost and just don’t know where to turn. After her son’s death, Rose became a high-profile and outspoken critic of the UK’s handling of the war and set up Military Families Against the War and the Justice 4 Gordon Gentle campaigns. She also contested the 2005 general election against Adam Ingram, the then armed forces minister. And last year, she was awarded an honorary doctorate by the University of Glasgow for her campaigning to improve conditions and military equipment for service personnel. Describing what she hears from vulnerable veterans, Rose said: “They come out the services and many are struggling. “They have lots of flashbacks; they’re so depressed and just can’t handle it. “Basically, it all goes back to what they’ve seen – they’ve got to come back and live with the nightmares while, at the same time, trying to get their lives going again. “A lot end up homeless and struggling. They’re really depressed and feel that life is not worth living. “It can take 10 to 15 years or more for them to admit what’s happening to them. So we’re only going to see more of it in the future. “When they come out of the army a lot of them just want to be on their own to have time to think; to clear their head. But it’s not that easy. “The services need to give them a lot more help and support – these boys are a special group who need extra help. 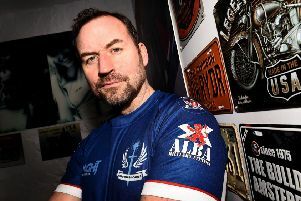 Combat Stress, the UK-wide charity working with veterans with PTSD and other mental health conditions, has seen a 143 per cent rise in referrals over the past ten years. Figures from January 2018 show that the charity had 365 registered veterans in Scotland, with 253 referred to its services for the first time in 2016. Johnston Press has established that at least 16 UK veterans are feared to have committed suicide since January, of whom at least seven were known to have fought in Iraq and Afghanistan. 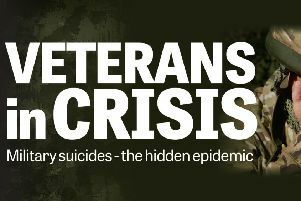 While suicide remains rare among military veterans and the last comprehensive study, completed in 2009, found the overall rate was comparable to the general population, there is evidence that a disturbing number of ex-soldiers – in particular those who fought in Iraq and Afghanistan – are taking their own lives or attempting to do so. Figures from a published study by Combat Stress, the oldest and largest veterans mental health charity, showed that 19 per cent of veterans it treated had moderate to severe suicidal thoughts. And according to Dr Dominic Murphy, a senior clinical lecturer at Combat Stress, an even bigger risk factor than post traumatic stress disorder (PTSD) is the depression which usually accompanies it. He said: “When you are in the military you have quite a high status. You have a job, are respected and have peers around you. “You then leave the armed forces and may not be working, may not have any friends or social support around you. “That loss of status can be very difficult for people, as it would be for anyone; a loss of meaning and direction. King’s College London recently did a representative study of serving and former military personnel. Around 20 per cent of those surveyed had depression, with only around four per cent having PTSD.